For other people named Neville Chamberlain, see Neville Chamberlain (disambiguation). 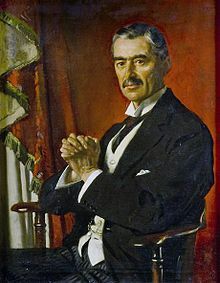 Arthur Neville Chamberlain FRS (/ˈtʃeɪmbərlɪn/; 18 March 1869 – 9 November 1940) was a British Conservative Party statesman who served as Prime Minister of the United Kingdom from May 1937 to May 1940. Chamberlain is best known for his foreign policy of appeasement, and in particular for his signing of the Munich Agreement in 1938, conceding the German-speaking Sudetenland region of Czechoslovakia to Germany. When Adolf Hitler invaded Poland, the UK declared war on Germany on 3 September 1939, and Chamberlain led Britain through the first eight months of the Second World War. After working in business and local government, and after a short spell as Director of National Service in 1916 and 1917, Chamberlain followed his father, Joseph Chamberlain, and older half-brother, Austen Chamberlain, in becoming a Member of Parliament in the 1918 general election for the new Birmingham Ladywood division at the age of 49. He declined a junior ministerial position, remaining a backbencher until 1922. He was rapidly promoted in 1923 to Minister of Health and then Chancellor of the Exchequer. After a short-lived Labour-led government, he returned as Minister of Health, introducing a range of reform measures from 1924 to 1929. He was appointed Chancellor of the Exchequer in the National Government in 1931. When Stanley Baldwin retired in May 1937, Chamberlain took his place as Prime Minister. His premiership was dominated by the question of policy towards an increasingly aggressive Germany, and his actions at Munich were widely popular among the British at the time. When Hitler continued his aggression, Chamberlain pledged Britain to defend Poland's independence if the latter were attacked, an alliance that brought his country into war when Germany and the Soviet Union invaded Poland in 1939. Chamberlain resigned the premiership on 10 May 1940 as the Allies were being forced to retreat from Norway, as he believed that a government supported by all parties was essential, and the Labour and Liberal parties would not join a government he headed. He was succeeded by Winston Churchill but remained very well regarded in Parliament, especially among Conservatives. Before ill health forced him to resign, he was an important member of Churchill's War Cabinet as Lord President of the Council, heading the Cabinet in the new premier's absence. Chamberlain died of cancer six months after leaving the premiership. Chamberlain's reputation remains controversial among historians, the initial high regard for him being entirely eroded by books such as Guilty Men, published in July 1940, which blamed Chamberlain and his associates for the Munich accord and for allegedly failing to prepare the country for war. Most historians in the generation following Chamberlain's death held similar views, led by Churchill in The Gathering Storm. Some later historians have taken a more favourable perspective of Chamberlain and his policies, citing government papers released under the Thirty Year Rule and arguing that going to war with Germany in 1938 would have been disastrous as the UK was unprepared. Nonetheless, Chamberlain is still unfavourably ranked amongst British Prime Ministers. Chamberlain was born on 18 March 1869 in a house called Southbourne in the Edgbaston district of Birmingham. He was the only son of the second marriage of Joseph Chamberlain, who later became Mayor of Birmingham and a Cabinet minister. His mother was Florence Kenrick, cousin to William Kenrick MP; she died when he was a small boy. Joseph Chamberlain had had another son, Austen Chamberlain, by his first marriage. Neville Chamberlain was educated at Rugby School. 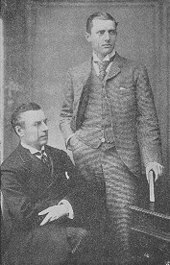 Joseph Chamberlain then sent Neville to Mason College (taking external exams of the University of London). Neville Chamberlain had little interest in his studies there, and in 1889 his father apprenticed him to a firm of accountants. Within six months he became a salaried employee. At forty, Chamberlain was expecting to remain a bachelor, but in 1910 he fell in love with Anne Cole, a recent connection by marriage, and married her the following year. They met through his Aunt Lilian, the Canadian-born widow of Joseph Chamberlain's brother Herbert, who in 1907 had married Anne Cole's uncle Alfred Clayton Cole, a director of the Bank of England. She encouraged and supported his entry into local politics and was to be his constant companion, helper, and trusted colleague, fully sharing his interests in housing and other political and social activities after his election as an MP. The couple had a son and a daughter. Chamberlain initially showed little interest in politics, though his father and half-brother were in Parliament. During the "Khaki election" of 1900 he made speeches in support of Joseph Chamberlain's Liberal Unionists. The Liberal Unionists were allied with the Conservatives and later merged with them under the name "Unionist Party", which in 1925 became known as the "Conservative and Unionist Party". 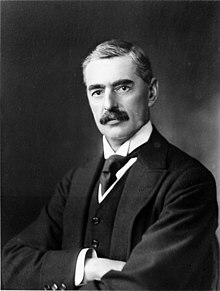 In 1911, Neville Chamberlain successfully stood as a Liberal Unionist for Birmingham City Council for the All Saints' Ward, located within his father's parliamentary constituency. 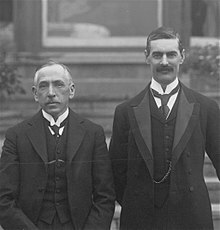 Chamberlain as Lord Mayor of Birmingham in May 1916, alongside Prime Minister Billy Hughes of Australia. Chamberlain was made chairman of the Town Planning Committee. Under his direction, Birmingham soon adopted one of the first town planning schemes in Britain. The start of the First World War in 1914 prevented implementation of his plans. In 1915, Chamberlain became Lord Mayor of Birmingham. Apart from his father Joseph, five of Chamberlain's uncles had also attained the chief Birmingham civic dignity: they were Joseph's brother Richard Chamberlain, William and George Kenrick, Charles Beale, who had been four times Lord Mayor and Sir Thomas Martineau. As a Lord Mayor in wartime, Chamberlain had a huge burden of work and he insisted that his councillors and officials work equally hard. He halved the Lord Mayor's expense allowance and cut back on the number of civic functions expected of the incumbent. In 1915, Chamberlain was appointed a member of the Central Control Board on liquor traffic. 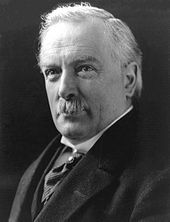 In December 1916, Prime Minister David Lloyd George offered Chamberlain the new position of Director of National Service, with responsibility for co-ordinating conscription and ensuring that essential war industries were able to function with sufficient workforces. His tenure was marked by conflict with Lloyd George; in August 1917, having received little support from the Prime Minister, Chamberlain resigned. The relationship between Chamberlain and Lloyd George would, thereafter, be one of mutual hatred. Chamberlain decided to stand for the House of Commons, and was adopted as Unionist candidate for Birmingham Ladywood. After the war ended, a general election was called almost immediately. The campaign in this constituency was notable because his Liberal Party opponent was Mrs Margery Corbett Ashby, one of the seventeen women candidates who stood for Parliament at the first election at which women were eligible to do so. Chamberlain reacted to this intervention by being one of the few male candidates to specifically target women voters deploying his wife, issuing a special leaflet headed "A word to the Ladies" and holding two meetings in the afternoon. Chamberlain was elected with almost 70% of the vote and a majority of 6,833. He was 49 years old, which remains to date the greatest age at which any future Prime Minister has first been elected to the Commons. Chamberlain threw himself into parliamentary work, begrudging the times when he was unable to attend debates and spending much time on committee work. He was chairman of the national Unhealthy Areas Committee (1919–21) and in that role, had visited the slums of London, Birmingham, Leeds, Liverpool and Cardiff. Consequently, in March 1920, Bonar Law offered him a junior post at the Ministry of Health on behalf of the Prime Minister, but Chamberlain was unwilling to serve under Lloyd George and was offered no further posts during Lloyd George's premiership. When Bonar Law resigned as party leader, Austen Chamberlain took his place as head of the Unionists in Parliament. Unionist leaders were willing to fight the 1922 election in coalition with the Lloyd George Liberals, but on 19 October, Unionist MPs held a meeting at which they voted to fight the election as a single party. Lloyd George resigned, as did Austen Chamberlain, and Bonar Law was recalled from retirement to lead the Unionists as Prime Minister. Many high-ranking Unionists refused to serve under Bonar Law to the benefit of Chamberlain, who rose over the course of ten months from backbencher to Chancellor of the Exchequer. Bonar Law initially appointed Chamberlain Postmaster General and Chamberlain was sworn of the Privy Council. When Sir Arthur Griffith-Boscawen, the Minister of Health, lost his seat in the 1922 election and failed to win a by-election in March 1923, Bonar Law offered the position to Chamberlain. Two months later, Bonar Law was diagnosed with advanced, terminal throat cancer. He immediately resigned and was replaced by Chancellor of the Exchequer Stanley Baldwin. In August 1923, Baldwin promoted Chamberlain to the position of Chancellor of the Exchequer. Chamberlain served only five months in the office before the Conservatives were defeated in the 1923 general election. Ramsay MacDonald became the first Labour Prime Minister, but his government fell within months, necessitating another general election. By a margin of only 77 votes, Chamberlain narrowly defeated the Labour candidate, Oswald Mosley, who later led the British Union of Fascists. Believing he would lose if he stood again in Birmingham Ladywood, Chamberlain arranged to be adopted for Birmingham Edgbaston, the district of the city where he was born and which was a much safer seat, which he would hold for the rest of his life. The Unionists won the election, but Chamberlain declined to serve again as Chancellor, preferring his former position as Minister of Health. Within two weeks of his appointment as Minister of Health, Chamberlain presented the Cabinet with an agenda containing 25 pieces of legislation he hoped to see enacted. Before he left office in 1929, 21 of the 25 bills had passed into law. Chamberlain sought the abolition of the elected Poor Law Boards of Guardians which administered relief—and which in some areas were responsible for rates. Many of the Boards were controlled by Labour, and such Boards had defied the government by distributing relief funds to the able-bodied unemployed. In 1929, Chamberlain initiated legislation to abolish the Poor Law boards entirely. Chamberlain spoke in the Commons for two and a half hours on the second reading of the Bill, and when he concluded he was applauded by all parties. The Bill passed into law. Though Chamberlain struck a conciliatory note during the 1926 General Strike, in general he had poor relations with the Labour opposition. Future Labour Prime Minister Clement Attlee complained that Chamberlain "always treated us like dirt," and in April 1927 Chamberlain wrote: "More and more do I feel an utter contempt for their lamentable stupidity." His poor relations with the Labour Party later played a major part in his downfall as Prime Minister. Baldwin called a general election for 30 May 1929, resulting in a hung parliament with Labour holding the most seats. Baldwin and his government resigned and Labour, under MacDonald, again took office. In 1931, the MacDonald government faced a serious crisis as the May Report revealed that the budget was unbalanced, with an expected shortfall of £120 million. The Labour government resigned on 24 August, and MacDonald formed a National Government supported by most Conservative MPs. Chamberlain once again returned to the Ministry of Health. After the 1931 general election, in which supporters of the National Government (mostly Conservatives) won an overwhelming victory, MacDonald designated Chamberlain as Chancellor of the Exchequer. Chamberlain proposed a 10% tariff on foreign goods and lower or no tariffs on goods from the colonies and the Dominions. Joseph Chamberlain had advocated a similar policy, "Imperial Preference"; Neville Chamberlain laid his bill before the House of Commons on 4 February 1932, and concluded his address by noting the appropriateness of his seeking to enact his father's proposal. At the end of the speech, Sir Austen Chamberlain walked down from the backbenches and shook his brother's hand. The Import Duties Act 1932 passed Parliament easily. Chamberlain presented his first budget in April 1932. He maintained the severe budget cuts that had been agreed at the inception of the National Government. Interest on the war debt was a major cost. Chamberlain reduced the annual interest rate on most of Britain's war debt from 5% to 3.5%. Between 1932 and 1938, Chamberlain halved the percentage of the budget devoted to interest on the war debt. Chamberlain hoped that a cancellation of the war debt owed to the United States could be negotiated. In June 1933, Britain hosted the World Monetary and Economic Conference, which came to nothing as US President Franklin D. Roosevelt sent word that he would not consider any war debt cancellation. By 1934, Chamberlain was able to declare a budget surplus and restore many of the cuts in unemployment compensation and civil servant salaries he had made after taking office. He told the Commons, "We have now finished the story of Bleak House and are sitting down this afternoon to enjoy the first chapter of Great Expectations." The Unemployed Assistance Board (UAB, established by the Unemployment Act 1934) was largely Chamberlain's creation, and he wished to see the issue of unemployment assistance removed from party political argument. Moreover, Chamberlain "saw the importance of 'providing some interest in life for the large numbers of men never likely to get work', and out of this realisation was to come the responsibility of the UAB for the 'welfare', not merely the maintenance, of the unemployed." Defence spending had been heavily cut in Chamberlain's early budgets. By 1935, faced with a resurgent Germany under Hitler's leadership (see German re-armament), he was convinced of the need for rearmament. Chamberlain especially urged the strengthening of the Royal Air Force, realising that Britain's historical bulwark, the English Channel, was no defence against air power. In 1935, MacDonald stood down as Prime Minister, and Baldwin became Prime Minister for the third time. In the 1935 general election, the Conservative-dominated National Government lost 90 seats from its massive 1931 majority, but still retained an overwhelming majority of 255 in the House of Commons. During the campaign, deputy Labour leader Arthur Greenwood had attacked Chamberlain for spending money on rearmament, saying that the rearmament policy was "the merest scaremongering; disgraceful in a statesman of Mr Chamberlain's responsible position, to suggest that more millions of money needed to be spent on armaments." Chamberlain is believed to have had a significant role in the 1936 abdication crisis. He wrote in his diary that Wallis Simpson, Edward VIII's intended wife, was "an entirely unscrupulous woman who is not in love with the King but is exploiting him for her own purposes. She has already ruined him in money and jewels ..." In common with the rest of the Cabinet, except Duff Cooper, he agreed with Baldwin that the King should abdicate if he married Simpson, and on 6 December he and Baldwin both stressed that the King should make his decision before Christmas; by one account, he believed that the uncertainty was "hurting the Christmas trade". The King abdicated on 10 December, four days after the meeting. Soon after the abdication, Baldwin announced that he would remain until shortly after the coronation of King George VI and Queen Elizabeth. On 28 May, two weeks after the Coronation, Baldwin resigned, advising the King to send for Chamberlain. Sir Austen did not live to see his brother's final "climb ... to the top of the greasy pole,"[b] having died two months earlier. Upon his accession Chamberlain considered calling a general election, but with three and a half years remaining in the current Parliament's term he decided to wait. At age 68, he was the second-eldest person in the 20th century (behind Sir Henry Campbell-Bannerman) to become Prime Minister for the first time, and was widely seen as a caretaker who would lead the Conservative Party until the next election and then step down in favour of a younger man, with Foreign Secretary Anthony Eden a likely candidate. From the start of Chamberlain's premiership a number of would-be successors were rumoured to be jockeying for position. Chamberlain had disliked what he considered to be the overly sentimental attitude of both Baldwin and MacDonald on Cabinet appointments and reshuffles. Although he had worked closely with the President of the Board of Trade, Walter Runciman, on the tariff issue, Chamberlain dismissed him from his post, instead offering him the token position of Lord Privy Seal, which an angry Runciman declined. Chamberlain thought Runciman, a member of the Liberal National Party, to be lazy. Soon after taking office, Chamberlain instructed his ministers to prepare two-year policy programmes. These reports were to be integrated with the intent of co-ordinating the passage of legislation through the current Parliament, the term of which was to expire in November 1940. At the time of his succession Chamberlain's personality was not well known to the public, though he had made annual budget broadcasts for six years. According to Chamberlain biographer Robert Self, these appeared relaxed and modern, showing an ability to speak directly to the camera. Chamberlain had few friends among his parliamentary colleagues; an attempt by his Parliamentary Private Secretary, Lord Dunglass (later Prime Minister himself as Alec Douglas-Home), to bring him to the Commons Smoking Room to socialise with colleagues ended in embarrassing silence. Chamberlain compensated for these shortcomings by devising the most sophisticated press management system employed by a Prime Minister up to that time, with officials at Number 10, led by his chief of press George Steward, convincing members of the press that they were colleagues sharing power and insider knowledge, and should espouse the government line. Chamberlain saw his elevation to the premiership as the final glory in a career as a domestic reformer, not realising that he would be remembered for foreign policy decisions. One reason he sought the settlement of European issues was the hope it would allow him to concentrate on domestic affairs. Soon after attaining the premiership, Chamberlain obtained passage of the Factories Act 1937. This Act was aimed at bettering working conditions in factories, and placed limits on the working hours of women and children. In 1938, Parliament enacted the Coal Act 1938, which allowed for nationalisation of coal deposits. Another major law passed that year was the Holidays with Pay Act. Though the Act only recommended that employers give workers a week off with pay, it led to a great expansion of holiday camps and other leisure accommodation for the working classes. The Housing Act of 1938 provided subsidies aimed at encouraging slum clearance and maintained rent control. Chamberlain's plans for the reform of local government were shelved because of the outbreak of war in 1939. Likewise, the raising of the school-leaving age to 15, scheduled for implementation on 1 September 1939, did not go into effect. Relations between the United Kingdom and the Irish Free State had been strained since the 1932 appointment of Éamon de Valera as President of the Executive Council. The Anglo-Irish Trade War, sparked by the withholding of money that Ireland had agreed to pay the United Kingdom, had caused economic losses on both sides, and the two nations were anxious for a settlement. The de Valera government also sought to sever the remaining ties between Ireland and the UK, such as ending the King's status as Irish Head of State. As Chancellor, Chamberlain had taken a hard-line stance against concessions to the Irish, but as premier sought a settlement with Ireland, being persuaded that the strained ties were affecting relations with other Dominions. Talks had been suspended under Baldwin in 1936 but resumed in November 1937. De Valera sought not only to alter the constitutional status of Ireland, but to overturn other aspects of the Anglo-Irish Treaty, most notably the issue of partition, as well as obtaining full control of the three "Treaty Ports" which had remained in British control. Britain, on the other hand, wished to retain the Treaty Ports, at least in time of war, and to obtain the money that Ireland had agreed to pay. The Irish proved very tough negotiators, so much so that Chamberlain complained that one of de Valera's offers had "presented United Kingdom ministers with a three-leafed shamrock, none of the leaves of which had any advantages for the UK." With the talks facing deadlock, Chamberlain made the Irish a final offer in March 1938 which acceded to many Irish positions, though he was confident that he had "only given up the small things," and the agreements were signed on 25 April 1938. The issue of partition was not resolved, but the Irish agreed to pay £10 million to the British. There was no provision in the treaties for British access to the Treaty Ports in time of war, but Chamberlain accepted de Valera's oral assurance that in the event of war the British would have access. Conservative backbencher Winston Churchill attacked the agreements in Parliament for surrendering the Treaty Ports, which he described as the "sentinel towers of the Western Approaches". When war came, de Valera denied Britain access to the Treaty Ports under Irish neutrality. Churchill railed against these treaties in The Gathering Storm, stating that he "never saw the House of Commons more completely misled" and that "members were made to feel very differently about it when our existence hung in the balance during the Battle of the Atlantic." Chamberlain believed that the Treaty Ports were unusable if Ireland was hostile, and deemed their loss worthwhile to assure friendly relations with Dublin. Chamberlain sought to conciliate Germany and make the Nazi state a partner in a stable Europe. He believed Germany could be satisfied by the restoration of some of her colonies, and during the Rhineland crisis of March 1936 he had stated that "if we were in sight of an all-round settlement the British government ought to consider the question" of restoration of colonies. The new Prime Minister's attempts to secure such a settlement were frustrated because Germany was in no hurry to talk to Britain. Foreign Minister Konstantin von Neurath was supposed to visit Britain in July 1937 but cancelled his visit. Lord Halifax, the Lord President of the Council, visited Germany privately in November and met Hitler and other German officials. Both Chamberlain and British Ambassador to Germany Nevile Henderson pronounced the visit a success. Foreign Office officials complained that the Halifax visit made it appear Britain was too eager for talks, and the Foreign Secretary, Anthony Eden, felt that he had been bypassed. Chamberlain also bypassed Eden while the Foreign Secretary was on holiday by opening direct talks with Italy, an international pariah for its invasion and conquest of Ethiopia. At a Cabinet meeting on 8 September 1937, Chamberlain indicated that he saw "the lessening of the tension between this country and Italy as a very valuable contribution toward the pacification and appeasement of Europe" which would "weaken the Rome–Berlin axis." The Prime Minister also set up a private line of communication with the Italian "Duce" Benito Mussolini through the Italian Ambassador, Count Dino Grandi. In February 1938, Hitler began to press the Austrian government to accept "Anschluß," or union between Germany and Austria. Chamberlain believed that it was essential to cement relations with Italy in the hope that an Anglo–Italian alliance would forestall Hitler from imposing his rule over Austria. Eden believed that Chamberlain was being too hasty in talking with Italy and holding out the prospect of de jure recognition of Italy's conquest of Ethiopia. Chamberlain concluded that Eden would have to accept his policy or resign. The Cabinet heard both men out but unanimously decided for Chamberlain, and despite efforts by other Cabinet members to prevent it, Eden resigned from office. In later years, Eden tried to portray his resignation as a stand against appeasement (Churchill described him in The Second World War as "one strong young figure standing up against long, dismal, drawling tides of drift and surrender") but many ministers and MPs believed there was no issue at stake worth resignation. Chamberlain appointed Lord Halifax as Foreign Secretary in Eden's place. It is perfectly evident now that force is the only argument Germany understands and that "collective security" cannot offer any prospect of preventing such events until it can show a visible force of overwhelming strength backed by the determination to use it. ... Heaven knows I don't want to get back to alliances but if Germany continues to behave as she has done lately she may drive us to it. On 14 March, the day after the "Anschluß," Chamberlain addressed the House of Commons and strongly condemned the methods used by the Germans in the takeover of Austria. Chamberlain's address met with the approval of the House. With Austria absorbed by Germany, attention turned to Hitler's obvious next target, the Sudetenland region of Czechoslovakia. With three million ethnic Germans, the Sudetenland represented the largest German population outside the "Reich" and Hitler began to call for the union of the region with Germany. Britain had no military obligations toward Czechoslovakia, but France and Czechoslovakia had a mutual assistance pact and both the French and Czechoslovaks also had an alliance with the Soviet Union. After the fall of Austria, the Cabinet's Foreign Policy Committee considered seeking a "grand alliance" to thwart Germany or, alternatively, an assurance to France of assistance if the French went to war. Instead, the committee chose to advocate that Czechoslovakia be urged to make the best terms it could with Germany. The full Cabinet agreed with the committee's recommendation, influenced by a report from the chiefs of staff stating that there was little that Britain could do to help the Czechs in the event of a German invasion. Chamberlain reported to an amenable House that he was unwilling to limit his government's discretion by giving commitments. Britain and Italy signed an agreement in April 1938. In exchange for de jure recognition of Italy's Ethiopian conquest, Italy agreed to withdraw some Italian "volunteers" from the Nationalist (pro-Franco) side of the Spanish Civil War. By this point, the Nationalists strongly had the upper hand in that conflict, and they completed their victory the following year. Later that month, the new French Prime Minister, Édouard Daladier, came to London for talks with Chamberlain, and agreed to follow the British position on Czechoslovakia. In May, Czech border guards shot two Sudeten German farmers who were trying to cross the border from Germany into Czechoslovakia without stopping for border controls. This incident caused unrest among the Sudeten Germans, and Germany was then said to be moving troops to the border. In response to the report, Prague moved troops to the German border. Halifax sent a note to Germany warning that if France intervened in the crisis on Czechoslovakia's behalf, Britain might support France. Tensions appeared to calm, and Chamberlain and Halifax were applauded for their "masterly" handling of the crisis. Though it was not known at the time, it later became clear that Germany had had no plans for a May invasion of Czechoslovakia. Nonetheless, the Chamberlain government received strong and almost unanimous support from the British press. Negotiations between the Czech government and the Sudeten Germans dragged on through mid-1938. They achieved little result; Sudeten leader Konrad Henlein was under private instructions from Hitler not to reach an agreement. On 3 August, Walter Runciman (by now Lord Runciman) travelled to Prague as a mediator sent by the British government. Over the next two weeks, Runciman met separately with Henlein, Czechoslovak President Edvard Beneš, and other leaders, but made no progress. On 30 August. Chamberlain met his Cabinet and Ambassador Henderson and secured their backing—with only First Lord of the Admiralty Duff Cooper dissenting against Chamberlain's policy to pressure Czechoslovakia into making concessions, on the ground that Britain was then in no position to back up any threat to go to war. Chamberlain realised that Hitler would likely signal his intentions in his 12 September speech at the annual Nuremberg Rally, and so the Prime Minister discussed with his advisors how to respond if war seemed likely. In consultation with his close advisor Sir Horace Wilson, Chamberlain set out "Plan Z". If war seemed inevitable, Chamberlain would fly to Germany to negotiate directly with Hitler. Lord Runciman continued his work, attempting to pressure the Czechoslovak government into concessions. On 7 September there was an altercation involving Sudeten members of the Czechoslovak parliament in the North Moravian city of Ostrava (Mährisch-Ostrau in German). The Germans made considerable propaganda out of the incident, though the Prague government tried to conciliate them by dismissing Czech police who had been involved. As the tempest grew, Runciman concluded that there was no point in attempting further negotiations until after Hitler's speech. The mission never resumed. Chamberlain (centre, hat and umbrella in hands) walks with German Foreign Minister Joachim von Ribbentrop (right) as the Prime Minister leaves for home after the Berchtesgaden meeting, 16 September 1938. On the left is Alexander von Dörnberg. The condition of the Sudeten Germans is indescribable. It is sought to annihilate them. As human beings they are oppressed and scandalously treated in an intolerable fashion ... The depriving of these people of their rights must come to an end. ... I have stated that the "Reich" would not tolerate any further oppression of these three and a half million Germans, and I would ask the statesmen of foreign countries to be convinced that this is no mere form of words. The following morning, 13 September, Chamberlain and the Cabinet were informed by Secret Service sources that all German embassies had been told that Germany would invade Czechoslovakia on 25 September. Convinced that the French would not fight (Daladier was privately proposing a three-Power summit to settle the Sudeten question), Chamberlain decided to implement "Plan Z" and sent a message to Hitler that he was willing to come to Germany to negotiate. Hitler accepted and Chamberlain flew to Germany on the morning of 15 September; this was the first time, excepting a short jaunt at an industrial fair, that Chamberlain had ever flown. Chamberlain flew to Munich and then travelled by rail to Hitler's retreat at Berchtesgaden. The face to face meeting lasted about three hours. Hitler demanded the annexation of the Sudetenland, and through questioning him, Chamberlain was able to obtain assurances that Hitler had no designs on the remainder of Czechoslovakia or on the areas in Eastern Europe which had German minorities. After the meeting Chamberlain returned to London, believing that he had obtained a breathing space during which agreement could be reached and the peace preserved. Under the proposals made at Berchtesgaden the Sudetenland would be annexed by Germany if a plebiscite in the Sudetenland favoured it. Czechoslovakia would receive international guarantees of its independence which would replace existing treaty obligations—principally the French pledge to the Czechoslovaks. The French agreed to the requirements. Under considerable pressure the Czechoslovaks also agreed, causing the Czechoslovak government to fall. Chamberlain (left) and Hitler leave the Bad Godesberg meeting, 23 September 1938. Chamberlain flew back to Germany, meeting Hitler in Bad Godesberg on 22 September. Hitler brushed aside the proposals of the previous meeting, saying "that won't do any more". Hitler demanded immediate occupation of the Sudetenland and that Polish and Hungarian territorial claims on Czechoslovakia be addressed. Chamberlain objected strenuously, telling Hitler that he had worked to bring the French and Czechoslovaks into line with Germany's demands, so much so that he had been accused of giving in to dictators and had been booed on his departure that morning. Hitler was unmoved. That evening, Chamberlain told Lord Halifax that the "meeting with Herr Hitler had been most unsatisfactory". The following day, Hitler kept Chamberlain waiting until mid-afternoon, when he sent a five-page letter, in German, outlining the demands he had made orally the previous day. Chamberlain replied by offering to act as an intermediary with the Czechoslovaks, and suggested that Hitler put his demands in a memorandum which could be circulated to the French and Czechoslovaks. The leaders met again late on the evening of 23 September—a meeting which stretched into the early morning hours. Hitler demanded that fleeing Czechs in the zones to be occupied take nothing with them. He extended his deadline for occupation of the Sudetenland to 1 October—the date he had long before secretly set for the invasion of Czechoslovakia. The meeting ended amicably, with Chamberlain confiding to Hitler his hopes they would be able to work out other problems in Europe in the same spirit. Hitler hinted that the Sudetenland fulfilled his territorial ambitions in Europe. Chamberlain flew back to London, saying "It is up to the Czechs now." How horrible, fantastic, incredible it is that we should be digging trenches and trying on gas-masks here because of a quarrel in a far-away country between people of whom we know nothing. It seems still more impossible that a quarrel that has already been settled in principle should be the subject of war. On 28 September, Chamberlain called on Hitler to invite him to Germany again to seek a solution through a summit involving the British, French, Germans, and Italians. Hitler replied favourably, and word of this response came to Chamberlain as he was winding up a speech in the House of Commons which sat in gloomy anticipation of war. Chamberlain informed the House of this in his speech. The response was a passionate demonstration, with members cheering Chamberlain wildly. Even diplomats in the galleries applauded. Lord Dunglass later commented, "There were a lot of appeasers in Parliament that day." On the morning of 29 September Chamberlain left Heston Aerodrome (to the east of today's Heathrow Airport) for his third and final visit to Germany. On arrival in Munich the British delegation was taken directly to the Führerbau, where Daladier, Mussolini, and Hitler soon arrived. 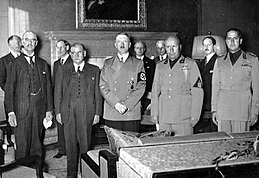 The four leaders and their translators held an informal meeting; Hitler said that he intended to invade Czechoslovakia on 1 October. Mussolini distributed a proposal similar to Hitler's Bad Godesberg terms. In reality, the proposal had been drafted by German officials and transmitted to Rome the previous day. 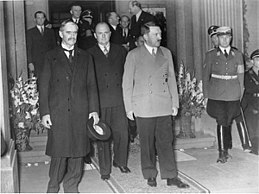 The four leaders debated the draft and Chamberlain raised the question of compensation for the Czechoslovak government and citizens, but Hitler refused to consider this. The leaders were joined by advisors after lunch, and hours were spent on long discussions of each clause of the "Italian" draft agreement. Late that evening the British and French left for their hotels, saying that they had to seek advice from their respective capitals. Meanwhile, the Germans and Italians enjoyed the feast which Hitler had intended for all the participants. During this break, Chamberlain advisor Sir Horace Wilson met with the Czechoslovaks; he informed them of the draft agreement and asked which districts were particularly important to them. The conference resumed at about 10 pm and was mostly in the hands of a small drafting committee. At 1:30 am the Munich Agreement was ready for signing, though the signing ceremony was delayed when Hitler discovered that the ornate inkwell on his desk was empty. Chamberlain and Daladier returned to their hotel and informed the Czechoslovaks of the agreement. The two Prime Ministers urged quick acceptance by the Czechoslovaks of the agreement, since the evacuation by the Czechs was to begin the following day. At 12:30 pm the Czechoslovak government in Prague objected to the decision but agreed to its terms. Neville Chamberlain holds the paper signed by both Hitler and himself on his return from Munich to Heston Aerodrome. 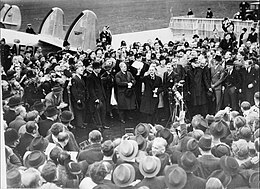 Neville Chamberlain speaks to the crowd upon arrival at Heston Aerodrome, 30 September 1938. Before leaving the "Führerbau," Chamberlain requested a private conference with Hitler. Hitler agreed, and the two met at Hitler's apartment in the city later that morning. Chamberlain urged restraint in the implementation of the agreement and requested that the Germans not bomb Prague if the Czechs resisted, to which Hitler seemed agreeable. Chamberlain took from his pocket a paper headed "Anglo–German Agreement," which contained three paragraphs, including a statement that the two nations considered the Munich Agreement "symbolic of the desire of our two peoples never to go to war again." According to Chamberlain, Hitler interjected "Ja! Ja!" ("Yes! Yes!") as the Prime Minister read it. The two men signed the paper then and there. When, later that day, German Foreign Minister Joachim von Ribbentrop remonstrated with Hitler for signing it, the Führer replied, "Oh, don't take it so seriously. That piece of paper is of no further significance whatever." Chamberlain, on the other hand, patted his breast pocket when he returned to his hotel for lunch and said, "I've got it!" Word leaked of the outcome of the meetings before Chamberlain's return, causing delight among many in London but gloom for Churchill and his supporters. My good friends, this is the second time there has come back from Germany to Downing Street peace with honour. I believe it is peace for our time. We thank you from the bottom of our hearts. Now I recommend you go home, and sleep quietly in your beds. King George issued a statement to his people, "After the magnificent efforts of the Prime Minister in the cause of peace it is my fervent hope that a new era of friendship and prosperity may be dawning among the peoples of the world." When the King met Duff Cooper, who resigned as First Lord of the Admiralty over the Munich Agreement, he told Cooper that he respected people who had the courage of their convictions, but could not agree with him. He wrote to his mother, Queen Mary, that "the Prime Minister was delighted with the results of his mission, as are we all." The dowager queen responded to her son with anger against those who spoke against the Prime Minister: "He brought home peace, why can't they be grateful?" Most newspapers supported Chamberlain uncritically, and he received thousands of gifts, from a silver dinner service to many of his trademark umbrellas. The Commons discussed the Munich Agreement on 3 October. Though Cooper opened by setting forth the reasons for his resignation and Churchill spoke harshly against the pact, no Conservative voted against the government. Only between 20 and 30 abstained, including Churchill, Eden, Cooper, and Harold Macmillan. In the aftermath of Munich, Chamberlain continued to pursue a course of cautious rearmament. He told the Cabinet in early October 1938, "[I]t would be madness for the country to stop rearming until we were convinced that other countries would act in the same way. For the time being, therefore, we should relax no particle of effort until our deficiencies had been made good." Later in October, he resisted calls to put industry on a war footing, convinced that such an action would show Hitler that the Prime Minister had decided to abandon Munich. Chamberlain hoped that the understanding he had signed with Hitler at Munich would lead toward a general settlement of European disputes, but Hitler expressed no public interest in following up on the accord. Having considered a general election immediately following Munich, Chamberlain instead reshuffled his Cabinet. By the end of the year, public concerns caused Chamberlain to conclude that "to get rid of this uneasy and disgruntled House of Commons by a General Election" would be "suicidal". Despite Hitler's relative quietness as the "Reich" absorbed the Sudetenland, foreign policy concerns continued to preoccupy Chamberlain. He made trips to Paris and Rome, hoping to persuade the French to hasten their rearmament and Mussolini to be a positive influence on Hitler. Several of his Cabinet members, led by Foreign Secretary Lord Halifax, began to draw away from the appeasement policy. Halifax was by now convinced that Munich, though "better than a European war," had been "a horrid business and humiliating". Public revulsion over the pogrom of Kristallnacht on 9 November 1938 made any attempt at a "rapprochement" with Hitler unacceptable, though Chamberlain did not abandon his hopes. Still hoping for reconciliation with Germany, Chamberlain made a major speech in Birmingham on 28 January 1939, in which he expressed his desire for international peace, and had an advance copy sent to Hitler at Berchtesgaden. Hitler seemed to respond; in his "Reichstag" speech on 30 January 1939, he stated that he wanted a "long peace". Chamberlain was confident that improvements in British defence since Munich would bring the dictator to the bargaining table. This belief was reinforced by a German official's conciliatory speech welcoming Ambassador Henderson back to Berlin after an absence for medical treatment in Britain. Chamberlain responded with a speech in Blackburn on 22 February hoping that the nations would resolve their differences through trade, and was gratified when his comments were printed in German newspapers. With matters appearing to improve, Chamberlain's rule over the House of Commons was firm and he was convinced the government would "romp home" in a late 1939 election. On 15 March 1939, Germany invaded the Czech provinces of Bohemia and Moravia, including Prague. Though Chamberlain's initial parliamentary response was, according to biographer Nick Smart, "feeble," within 48 hours he had spoken more forcefully against the German aggression. In another Birmingham speech, on 17 March, Chamberlain warned that "no greater mistake could be made than to suppose that because it believes war to be a senseless and cruel thing the nation has so lost its fibre that it will not take part to the utmost of its power in resisting such a challenge if it were ever made." The Prime Minister questioned whether the invasion of Czechoslovakia was "the end of an old adventure, or the beginning of a new" and whether it was "a step in the direction of an attempt to dominate the world by force." Colonial Secretary Malcolm MacDonald said, "whereas the Prime Minister was once a strong advocate of peace, he has now definitely swung around to the war point of view." This speech was met with widespread approval in Britain and recruitment for the armed services increased considerably. Chamberlain set out to build an interlocking series of defence pacts among the remaining European countries as a means of deterring Hitler from war. He sought an agreement among Britain, France, the USSR, and Poland, whereby the first three would go to the assistance of Poland if her independence were threatened, but Polish mistrust of the Soviet Union caused those negotiations to fail. Instead, on 31 March 1939, Chamberlain informed an approving House of Commons of British and French guarantees that they would lend Poland all possible aid in the event of any action which threatened Polish independence. In the ensuing debate, Eden stated that the nation was now united behind the government. Even Churchill and Lloyd George praised Chamberlain's government for issuing the guarantee to Poland. The Prime Minister took other steps to deter Hitler from aggression. He doubled the size of the Territorial Army, created a Ministry of Supply to expedite the provision of equipment to the armed forces, and instituted peacetime conscription. The Italian invasion of Albania on 7 April 1939 led to guarantees being given to Greece and Romania. On 17 June 1939, Handley Page received an order for 200 Hampden twin-engined medium bombers, and by 3 September 1939, the chain of radar stations girdling the British coast was fully operational. Chamberlain was reluctant to seek a military alliance with the Soviet Union; he distrusted Joseph Stalin ideologically and felt that there was little to gain, given the recent massive purges in the Red Army. Much of his Cabinet favoured such an alliance, and when Poland withdrew her objection to an Anglo–Soviet alliance, Chamberlain had little choice but to proceed. The talks with Soviet Foreign Minister Vyacheslav Molotov, to which Britain sent only a low-level delegation, dragged on over several months and eventually foundered on 14 August 1939 when Poland and Romania refused to allow Soviet troops to be stationed on their territories. A week after the failure of these talks, the Soviet Union and Germany signed the Molotov–Ribbentrop Pact, committing the countries to non-aggression toward each other. A secret agreement divided up Poland in the event of war. Chamberlain had disregarded rumours of a Soviet–German "rapprochement" and was dismissive of the publicly announced pact, stating that it in no way affected British obligations toward Poland. On 23 August 1939, Chamberlain had Henderson deliver a letter to Hitler telling him that Britain was fully prepared to comply with its obligations to Poland. Hitler instructed his generals to prepare for an invasion of Poland, telling them, "Our enemies are small worms. I saw them at Munich." Neville Chamberlain announces war with Germany, 3 September 1939. Germany invaded Poland in the early morning of 1 September 1939. The British Cabinet met late that morning and issued a warning to Germany that unless it withdrew from Polish territory Britain would carry out its obligations to Poland. When the House of Commons met at 6:00 pm, Chamberlain and Labour deputy leader Arthur Greenwood (deputising for the sick Clement Attlee) entered the chamber to loud cheers. Chamberlain spoke emotionally, laying the blame for the conflict on Hitler. This morning, the British ambassador in Berlin, handed the German government, the final note, stating that unless we heard from them, by 11 o'clock, that they were prepared at once, to withdraw their troops from Poland, a state of war would exist between us. I have to tell you now, that no such undertaking has been received, and that consequently, this country is now at war with Germany. ... We have a clear conscience; we have done all that any country could do to establish peace. The situation in which no word given by Germany's ruler could be trusted, and no people or country could feel itself safe had become intolerable ... Now may God bless you all. May He defend the right. It is the evil things we shall be fighting against—brute force, bad faith, injustice, oppression, and persecution—and against them I am certain that the right will prevail. Everything that I have worked for, everything that I have hoped for, everything that I have believed in during my public life has crashed into ruins. There is only one thing left for me to do: that is devote what strength and power I have to forwarding the victory of the cause for which we have sacrificed so much. Chamberlain instituted a War Cabinet and invited the Labour and Liberal parties to join his government, but they declined. He restored Churchill to the Cabinet as First Lord of the Admiralty, with a seat in the War Cabinet. Chamberlain also gave Eden a government post (Dominions Secretary) but not a seat in the small War Cabinet. The new First Lord proved to be a difficult Cabinet colleague, deluging the Prime Minister with a sea of lengthy memos. Chamberlain castigated Churchill for sending so many memos, as the two met in War Cabinet every day. Chamberlain suspected, correctly as it proved after the war, that "these letters are for the purpose of quotation in the Book that he will write hereafter." Chamberlain was also able to deter some of Churchill's more extreme plans, such as Operation Catherine, which would have sent three heavily armoured battleships into the Baltic Sea with an aircraft carrier and other support vessels as a means of stopping shipments of iron ore to Germany. With the naval war the only significant front involving the British in the early months of the conflict, the First Lord's obvious desire to wage a ruthless, victorious war established him as a leader-in-waiting in the public consciousness and among parliamentary colleagues. With little land action in the west, the initial months of the war were dubbed the "Bore War," later renamed the "Phoney War" by journalists. Chamberlain, in common with most Allied officials and generals, felt the war could be won relatively quickly by keeping economic pressure on Germany through a blockade while continuing rearmament. The Prime Minister was reluctant to go too far in altering the British economy. The government submitted an emergency war budget about which Chamberlain stated, "the only thing that matters is to win the war, though we may go bankrupt in the process." Government expenditures rose by little more than the rate of inflation between September 1939 and March 1940. Despite these difficulties, Chamberlain still enjoyed approval ratings as high as 68% and almost 60% in April 1940. In early 1940 the Allies approved a naval campaign designed to seize the northern part of Norway, a neutral country, including the key port of Narvik, and possibly also to seize the iron mines at Gällivare in northern Sweden, from which Germany obtained much of its iron ore. As the Baltic froze in winter, the iron ore was then sent south by ship from Narvik. The Allies planned to begin by mining Norwegian waters, thus provoking a German reaction in Norway, and then would occupy much of the country. Unforeseen by the Allies, Germany had also planned to occupy Norway, and on 9 April German troops occupied Denmark and began an invasion of Norway. German forces quickly overran much of the country. The Allies sent troops to Norway, but they met with little success, and on 26 April the War Cabinet ordered a withdrawal. The Prime Minister's opponents decided to turn the adjournment debate for the Whitsun recess into a challenge to Chamberlain, who soon heard about the plan. After initial anger, Chamberlain determined to fight. What became known as the "Norway debate" opened on 7 May, and lasted for two days. The initial speeches, including Chamberlain's, were nondescript, but Admiral of the Fleet Sir Roger Keyes, member for Portsmouth North, in full uniform, delivered a withering attack on the conduct of the Norway campaign, though he excluded Churchill from criticism. Leo Amery then delivered a speech which he concluded by echoing Oliver Cromwell's words on dissolving the Long Parliament: "You have sat here too long for any good you are doing. Depart, I say, and let us have done with you. In the name of God, go!" When Labour announced that they would call for a division of the House of Commons, Chamberlain called upon his "friends—and I still have some friends in this House—to support the Government tonight." Because the use of the word "friends" was a conventional term to refer to party colleagues, and, according to biographer Robert Self, many MPs took it that way, it was an "error of judgment" for Chamberlain to refer to party loyalty "when the gravity of the war situation required national unity." Lloyd George joined the attackers, and Churchill concluded the debate with a vigorous speech in support of the government. When the division took place, the government, which had a normal majority of over 200, prevailed by only 81, with 38 MPs in receipt of the government whip voting against it, with between 20 and 25 abstaining. Neville Chamberlain speaks to the nation following his resignation as Prime Minister, 10 May 1940. For the hour has now come when we are to be put to the test, as the innocent people of Holland, Belgium, and France are being tested already. And you and I must rally behind our new leader, and with our united strength, and with unshakable courage fight, and work until this wild beast, which has sprung out of his lair upon us, has been finally disarmed and overthrown. Queen Elizabeth told Chamberlain that her daughter, Princess Elizabeth, wept as she heard the broadcast. Churchill wrote to express his gratitude for Chamberlain's willingness to stand by him in the nation's hour of need, and Lord Baldwin, the only living former Prime Minister besides Chamberlain and Lloyd George, wrote, "You have passed through fire since we were talking together only a fortnight ago, and you have come out pure gold." In a departure from usual practice, Chamberlain did not issue any resignation Honours list. With Chamberlain remaining leader of the Conservative Party, and with many MPs still supporting him and distrusting the new Prime Minister, Churchill refrained from any purge of Chamberlain loyalists. Churchill wished Chamberlain to return to the Exchequer, but he declined, convinced that this would lead to difficulties with the Labour Party. Instead, he accepted the post of Lord President of the Council with a seat in the shrunken five-member War Cabinet. When Chamberlain entered the House of Commons on 13 May 1940, for the first time since his resignation, "MPs lost their heads, they shouted, they cheered, they waved their order papers, and his reception was a regular ovation." The House received Churchill coolly; some of his great speeches to the chamber, such as "We shall fight on the beaches," met with only half-hearted enthusiasm. Chamberlain's fall from power left him deeply depressed; he wrote, "Few men can have known such a reversal of fortune in so short a time." He especially regretted the loss of Chequers as "a place where I have been so happy," though after a farewell visit there by the Chamberlains on 19 June, he wrote, "I am content now that I have done that, and shall put Chequers out of my mind." As Lord President, Chamberlain assumed vast responsibilities over domestic issues and chaired the War Cabinet during Churchill's many absences. Attlee later remembered him as "free from any of the rancour he might have felt against us. He worked very hard and well: a good chairman, a good committeeman, always very businesslike." As chairman of the Lord President's Committee, he exerted great influence over the wartime economy. Halifax reported to the War Cabinet on 26 May 1940, with the Low Countries conquered and French Prime Minister Paul Reynaud warning that France might have to sign an armistice, that diplomatic contacts with a still-neutral Italy offered the possibility of a negotiated peace. Halifax urged following up and seeing if a worthwhile offer could be obtained. The battle over the course of action within the War Cabinet lasted three days; Chamberlain's statement on the final day, that there was unlikely to be an acceptable offer and that the matter should not be pursued at that time, helped persuade the War Cabinet to reject negotiations. Twice in May 1940, Churchill broached the subject of bringing Lloyd George into the government. Each time, Chamberlain indicated that due to their longtime antipathy he would immediately retire if Lloyd George were appointed a minister. Churchill did not appoint Lloyd George, but brought up the subject with Chamberlain again early in June. This time, Chamberlain agreed to Lloyd George's appointment provided Lloyd George gave a personal assurance to put aside the feud. Lloyd George declined to serve in Churchill's government. Chamberlain worked to bring his Conservative Party in line behind Churchill, working with the Chief Whip, David Margesson, to overcome members' suspicions and dislikes of the Prime Minister. On 4 July, after the British attack on the French fleet, Churchill entered the chamber to a great cheer from Conservative MPs orchestrated by the two, and the Prime Minister was almost overcome with emotion at the first cheer he had received from his own party's benches since May. Churchill returned the loyalty, refusing to consider Labour and Liberal attempts to expel Chamberlain from the government. When criticisms of Chamberlain appeared in the press, and when Chamberlain learned that Labour intended to use an upcoming secret session of Parliament as a platform to attack him, he told Churchill that he could only defend himself by attacking Labour. The Prime Minister intervened with the Labour Party and the press and the criticism ceased, according to Chamberlain, "like turning off a tap". In July 1940, a polemic titled Guilty Men was released by "Cato"—a pseudonym for three journalists (including future Labour leader Michael Foot). It attacked the record of the National Government, alleging that it had failed to prepare adequately for war. It called for the removal of Chamberlain and other ministers who had allegedly contributed to the British disasters of the early part of the war. The short book sold more than 200,000 copies, many of which were passed from hand-to-hand, and went into 27 editions in the first few months, despite not being carried by several major bookshops. According to historian David Dutton, "its impact upon Chamberlain's reputation, both among the general public and within the academic world, was profound indeed." Chamberlain had long enjoyed excellent health, except for occasional attacks of gout, but by July 1940 he was in almost constant pain. He sought treatment, and later that month entered hospital for surgery. Surgeons discovered that he was suffering from terminal bowel cancer, but they concealed it from him, instead telling him that he would not require further surgery. Chamberlain resumed work in mid-August. He returned to his office on 9 September, but renewed pain, compounded by the night-time bombing of London which forced him to go to an air raid shelter and denied him rest, sapped his energy, and he left London for the last time on 19 September, returning to Highfield Park in Heckfield. Chamberlain offered his resignation to Churchill on 22 September. The Prime Minister was initially reluctant to accept, but as both men realised that Chamberlain would never return to work, Churchill finally allowed him to resign. The Prime Minister asked if Chamberlain would accept the highest order of British chivalry, the Order of the Garter, of which his brother had been a member. Chamberlain refused, saying he would "prefer to die plain 'Mr Chamberlain' like my father before me, unadorned by any title." [I]t was the hope of doing something to improve the conditions of life for the poorer people that brought me at past middle life into politics, and it is some satisfaction to me that I was able to carry out some part of my ambition even though its permanency may be challenged by the destruction of war. For the rest I regret nothing that I have done & I can see nothing undone that I ought to have done. I am therefore content to accept the fate that has so suddenly overtaken me. Whatever else history may or may not say about these terrible, tremendous years, we can be sure that Neville Chamberlain acted with perfect sincerity according to his lights and strove to the utmost of his capacity and authority, which were powerful, to save the world from the awful, devastating struggle in which we are now engaged. This alone will stand him in good stead as far as what is called the verdict of history is concerned. Though some Chamberlain supporters found Churchill's oratory to be faint praise of the late Prime Minister, Churchill added less publicly, "Whatever shall I do without poor Neville? I was relying on him to look after the Home Front for me." Amongst others who paid tribute to Chamberlain in the Commons and in the House of Lords on 12 November were Lord Halifax, Attlee, and the Liberal Party leader and Air Minister, Sir Archibald Sinclair. Lloyd George, the only former Prime Minister remaining in the Commons, had been expected to speak, but absented himself from the proceedings. Ever close to his family, the executors of Chamberlain's will were his cousins, Wilfred Byng Kenrick and Sir Wilfrid Martineau, both of whom, like Chamberlain, were Lord Mayors of Birmingham. So far as my personal reputation is concerned, I am not in the least disturbed about it. The letters which I am still receiving in such vast quantities so unanimously dwell on the same point, namely without Munich the war would have been lost and the Empire destroyed in 1938 ... I do not feel the opposite view ... has a chance of survival. Even if nothing further were to be published giving the true inside story of the past two years I should not fear the historian's verdict. Guilty Men was not the only Second World War tract that damaged Chamberlain's reputation. We Were Not All Wrong, published in 1941, took a similar tack to Guilty Men, arguing that Liberal and Labour MPs, and a small number of Conservatives, had fought against Chamberlain's appeasement policies. The author, Liberal MP Geoffrey Mander, had voted against conscription in 1939. Another polemic against Conservative policies was Why Not Trust the Tories (1944, written by "Gracchus", who was later revealed to be future Labour minister Aneurin Bevan), which castigated the Conservatives for the foreign policy decisions of Baldwin and Chamberlain. Though a few Conservatives offered their own versions of events, most notably MP Quintin Hogg in his 1945 The Left was Never Right, by the end of the war, there was a very strong public belief that Chamberlain was culpable for serious diplomatic and military misjudgements that had nearly caused Britain's defeat. Chamberlain's reputation was devastated by these attacks from the left. In 1948, with the publication of The Gathering Storm, the first volume of Churchill's six-volume set, The Second World War, Chamberlain sustained an even more serious assault from the right. While Churchill stated privately, "this is not history, this is my case", his series was still hugely influential. Churchill depicted Chamberlain as well-meaning but weak, blind to the threat posed by Hitler, and oblivious to the fact that (according to Churchill) Hitler could have been removed from power by a grand coalition of European states. Churchill suggested that the year's delay between Munich and war worsened Britain's position, and criticised Chamberlain for both peacetime and wartime decisions. In the years following the publication of Churchill's books, few historians questioned his judgment. Anne Chamberlain, the former premier's widow, suggested that Churchill's work was filled with matters that "are not real misstatements that could easily be corrected, but wholesale omissions and assumptions that certain things are now recognised as facts which actually have no such position". Many of Chamberlain's family letters and his extensive personal papers were bequeathed by his family in 1974 to the Birmingham University Archives. During the war, the Chamberlain family had commissioned historian Keith Feiling to produce an official biography, and gave him access to Chamberlain's private diaries and papers. While Feiling had the right of access to official papers as the official biographer of a recently deceased person, he may not have been aware of the provision, and the Cabinet Secretary denied his requests for access. Though Feiling produced what historian David Dutton described in 2001 as "the most impressive and persuasive single-volume biography" of Chamberlain (completed during the war and published in 1946), he could not repair the damage already done to Chamberlain's reputation. Conservative MP Iain Macleod's 1961 biography of Chamberlain was the first major biography of a revisionist school of thought on Chamberlain. The same year, A. J. P. Taylor, in his The Origins of the Second World War, found that Chamberlain had adequately rearmed Britain for defence (though a rearmament designed to defeat Germany would have taken massive additional resources) and described Munich as "a triumph for all that was best and most enlightened in British life ... [and] for those who had courageously denounced the harshness and short-sightedness of Versailles". The adoption of the "thirty-year rule" in 1967 made available many of the papers of the Chamberlain government over the subsequent three years, helping to explain why Chamberlain acted as he did. 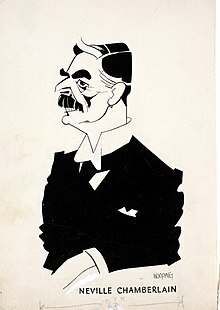 The resultant works greatly fuelled the revisionist school, although they also included books that strongly criticised Chamberlain, such as Keith Middlemas's 1972 Diplomacy of Illusion (which portrayed Chamberlain as a seasoned politician with strategic blindness when it came to Germany). Released papers indicated that, contrary to claims made in Guilty Men, Chamberlain had neither ignored the advice of the Foreign Office nor had he disregarded and run roughshod over his Cabinet. Other released papers showed that Chamberlain had considered seeking a grand coalition amongst European governments like that later advocated by Churchill, but had rejected it on the ground that the division of Europe into two camps would make war more, not less likely. They also showed that Chamberlain had been advised that the Dominions, pursuing independent foreign policies under the Statute of Westminster, had indicated that Chamberlain could not depend on their help in the event of a Continental war. The Chiefs of Staff report, which indicated that Britain could not forcibly prevent Germany from conquering Czechoslovakia, was first publicly known at this time. In reaction to the revisionist school of thought regarding Chamberlain a post-revisionist school emerged beginning in the 1990s, using the released papers to justify the initial conclusions of Guilty Men. Oxford historian R. A. C. Parker argued that Chamberlain could have forged a close alliance with France after the Anschluß, in early 1938, and begun a policy of containment of Germany under the auspices of the League of Nations. While many revisionist writers had suggested that Chamberlain had had few or no choices in his actions, Parker argued that Chamberlain and his colleagues had chosen appeasement over other viable policies. In his two volumes, Chamberlain and Appeasement (1993) and Churchill and Appeasement (2000), Parker stated that Chamberlain, due to his "powerful, obstinate personality" and his skill in debate, caused Britain to embrace appeasement instead of effective deterrence. Parker also suggested that had Churchill held high office in the second half of the 1930s Churchill would have built a series of alliances which would have deterred Hitler, and perhaps would have caused Hitler's domestic opponents to procure his removal. Whatever else may be said of Chamberlain's public life his reputation will in the last resort depend upon assessments of this moment [Munich] and this policy [appeasement]. This was the case when he left office in 1940 and it remains so sixty years later. To expect otherwise is rather like hoping that Pontius Pilate will one day be judged as a successful provincial administrator of the Roman Empire. ^ Joseph Chamberlain's loss is equivalent to £29.1 million if measured as per capita gross domestic product; £4.2 million if measured as an RPI equivalent. See MeasuringWorth. ^ A well-known quotation by Disraeli, see Meynell 1903, p. 155. Chamberlain would later allude to Disraeli in stating he had brought for the second time "peace with honour" from Germany to Downing Street after the Munich Conference. ^ "Peace in our time", a common misquotation, is a quotation from the Book of Common Prayer, and can be found as a misquotation in The New York Times as early as 2 October 1938. Faber 2008, pp. 5–7. ^ Disraeli (or more properly Lord Beaconsfield) had stated "Lord Salisbury and I have brought you peace—but a peace, I hope, with honour." See Keyes 2006, p. 160. ^ Paul Strangio; et al. (2013). Understanding Prime-Ministerial Performance: Comparative Perspectives. Oxford UP. pp. 224, 226. ISBN 978-0-19-966642-3. ^ Macklin 2006, p. 11. ^ Smart 2010, pp. 2–3. ^ Smart 2010, pp. 5–6. ^ Smart 2010, pp. 6–8. ^ Self 2006, p. 21. ^ Self 2006, p. 22. ^ Dutton 2001, p. 9. ^ Smart 2010, p. 33. ^ Smart 2010, pp. 33–34. ^ "The United Hospitals Conference of Great Britain and Ireland". The Times. 7 December 1906. p. 8. Retrieved 25 February 2013. ^ Self 2006, p. 31. ^ a b Self 2006, pp. 33–35. ^ Dilks 1984, pp. 115–116. ^ Smart 2010, p. 39. ^ Self 2006, p. 40. ^ Smart 2010, p. 53. ^ Self 2006, pp. 40–41. ^ Self 2006, p. 41. ^ Self 2006, pp. 42–43. ^ Smart 2010, p. 62. ^ a b Who Was Who, 1929–1940. A and C Black. 1949. p. 235. ^ Smart 2010, p. 67. ^ Smart 2010, pp. 77–79. ^ Smart 2010, p. 70. ^ Self 2006, p. 68. ^ a b Dilks 1984, p. 262. ^ Hallam, David J.A. Taking on the Men: the first women parliamentary candidates 1918, Studley, 2018 chapter 4, 'Corbett Ashby in Ladywood'. Chamberlain's letters to his sisters detailing the campaign are deposited at the Cadbury Research Library, University of Birmingham. ^ Self 2006, p. 73. ^ Englefield 1995, p. 388. ^ Pepper, S. (March 2009). "Homes Unfit for Heroes". The Slum Problem in London and Neville Chamberlain's Unhealthy Areas Committee, 1919–21. 1 March 2009 – Academic journal article – By Pepper, Simon; Richmond, Peter. 80 (2): 143. Retrieved 1 March 2013. ^ Yelling, J. A. (31 July 2004). Slums and Redevelopment. Routledge 1992. pp. 26–27. ISBN 9781135372286. Retrieved 1 March 2013. ^ Self 2006, pp. 79–80. ^ Smart 2010, pp. 94–95. ^ Smart 2010, p. 96. ^ Self 2006, p. 87. ^ Self 2006, pp. 87–88. ^ a b c d e f g h Kelly's Handbook to the Titled, Landed and Official Classes 1940. Kelly's. p. 433. ^ Self 2006, p. 89. ^ Smart 2010, pp. 106–07. ^ Macklin 2006, pp. 24–25. ^ Self 2006, p. 103. ^ Dutton 2001, p. 14. ^ Self 2006, p. 106. ^ Self 2006, pp. 116–18. ^ Smart 2010, pp. 139–40. ^ Self 2006, p. 115. ^ Self 2006, p. 429. ^ Dilks 1984, pp. 584–86. ^ Smart 2010, pp. 160–62. ^ Self 2006, p. 161. ^ Self 2006, pp. 161–62. ^ Self 2006, p. 163. ^ Self 2006, pp. 165–66. ^ a b Dutton 2001, p. 17. ^ Smart 2010, p. 173. ^ Macklin 2006, p. 32. ^ a b Smart 2010, p. 174. ^ Maurice Bruce (1968). The coming of the Welfare State. Batsford. p. 370. ^ Macklin 2006, p. 36. ^ a b Dutton 2001, p. 18. ^ Macklin 2006, pp. 36–42. ^ Smart 2010, pp. 199–200. ^ Dutton 2001, p. 40. ^ Ziegler, Philip (1991). King Edward VIII. Alfred A. Knopf. p. 312. ISBN 978-0-394-57730-2. ^ Gilbert, Martin (1981). Winston Churchill, The Wilderness Years. Macmillan. pp. 169–70. ISBN 978-0-333-32564-3. ^ Macklin 2006, pp. 44–45. ^ Smart 1999, p. 148. ^ a b c Self 2006, p. 261. ^ Smart 2010, pp. 224–25. ^ Self 2006, p. 264. ^ Faber 2008, p. 171. ^ Faber 2008, p. 172. ^ Macklin 2006, p. 48. ^ Macklin 2006, p. 52. ^ a b c Macklin 2006, p. 158. ^ a b Taylor 1965, p. 406. ^ a b c d e f g Self 2006, pp. 298–99. ^ Macklin 2006, p. 64. ^ a b Smart 2010, p. 225. ^ Self 2006, p. 279. ^ Smart 2010, p. 226. ^ Smart 2010, pp. 225–26. ^ Self 2006, pp. 273–74. ^ Self 2006, p. 274. ^ Smart 2010, pp. 228–29. ^ Smart 2010, pp. 230–32. ^ a b Self 2006, p. 286. ^ Faber 2008, p. 103. ^ a b Smart 2010, p. 232. ^ a b c d e f Self 2006, p. 304. ^ a b Faber 2008, p. 148. ^ Self 2006, p. 302. ^ Faber 2008, p. 156. ^ Smart 2010, p. 237. ^ a b Faber 2008, pp. 159–60. ^ Faber 2008, p. 160. ^ Smart 2010, p. 234. ^ Faber 2008, p. 162. ^ Faber 2008, p. 189. ^ Faber 2008, pp. 202–03. ^ Faber 2008, pp. 199–200. ^ Faber 2008, pp. 211–14. ^ Faber 2008, pp. 230–34. ^ Self 2006, p. 308. ^ Faber 2008, pp. 244–46. ^ Faber 2008, pp. 263–66. ^ Faber 2008, p. 277. ^ Self 2006, pp. 310–12. ^ Self 2006, pp. 312–14. ^ Smart 2010, p. 242. ^ Faber 2008, pp. 319–24. ^ a b c Self 2006, p. 316. ^ Faber 2008, p. 334. ^ Faber 2008, p. 337. ^ Faber 2008, pp. 340–42. ^ Self 2006, pp. 318–20. ^ Self 2006, p. 321. ^ Faber 2008, pp. 375–76. ^ Faber 2008, p. 382. ^ a b Self 2006, p. 323. ^ Self 2006, p. 324. ^ Faber 2008, pp. 403–07. ^ Faber 2008, pp. 407–10. ^ Faber 2008, pp. 410–11. ^ Faber 2008, pp. 413–14. ^ Self 2006, pp. 324–25. ^ Faber 2008, p. 417. ^ Self 2006, p. 325. ^ Faber 2008, pp. 417–18. ^ Faber 2008, p. 5. ^ a b c Faber 2008, pp. 5–7. ^ a b c Faber 2008, p. 420. ^ Faber 2008, p. 6. ^ Faber 2008, pp. 420–21. ^ Self 2006, p. 330. ^ Faber 2008, pp. 424–25. ^ a b Self 2006, p. 333. ^ Smart 2010, p. 249. ^ Self 2006, pp. 334–35. ^ Smart 2010, p. 250. ^ Self 2006, p. 341. ^ Smart 2010, pp. 250–51. ^ Self 2006, p. 339. ^ Self 2006, pp. 344–45. ^ a b Self 2006, pp. 345–46. ^ Self 2006, p. 347. ^ Self 2006, p. 348. ^ Smart 2010, p. 254. ^ Self 2006, pp. 352–53. ^ Dutton 2001, p. 58. ^ Self 2006, p. 353. ^ Courcy 1940, p. 98. ^ a b Self 2006, p. 354. ^ Self 2006, p. 357. ^ Dutton 2001, pp. 58–59. ^ Self 2006, p. 358. ^ Smart 2010, p. 255. ^ Self 2006, pp. 358–59. ^ Philpott, Ian M. (2008). The Royal Air Force: An Encyclopedia of the Inter-War Years. Volume II: Rearmament 1930–1939. Pen and Sword. pp. 222–23. ISBN 978-1-84415-391-6. ^ Self 2006, pp. 367–69. ^ a b Self 2006, p. 369. ^ Smart 2010, p. 261. ^ Self 2006, p. 378. ^ "BRITISH NOTE TO GERMANY. (Hansard, 1 September 1939)". hansard.millbanksystems.com. ^ Self 2006, pp. 378–79. ^ Smart 2010, p. 263. ^ a b Self 2006, p. 380. ^ Dutton 2001, p. 59. ^ Feiling 1970, p. 416. ^ a b Self 2006, p. 382. ^ Self 2006, pp. 386–87. ^ Self 2006, pp. 387–88. ^ Smart 2010, p. 269. ^ Smart 2010, p. 265. ^ Self 2006, p. 383. ^ Smart 2010, p. 268. ^ a b Self 2006, p. 390. ^ Self 2006, p. 391. ^ Dutton 2001, p. 61. ^ Smart 2010, p. 273. ^ a b Self 2006, pp. 415–16. ^ Self 2006, pp. 420–21. ^ Erin Redihan, "Neville Chamberlain and Norway: The Trouble with 'A Man of Peace' in a Time of War." New England Journal of History (2013) 69#1/2 pp. 1-18. ^ Self 2006, p. 423. ^ Self 2006, pp. 424–25. ^ a b Self 2006, p. 425. ^ Self 2006, p. 426. ^ Dutton 2001, pp. 63–64. ^ a b Self 2006, pp. 428–30. ^ Dutton 2001, p. 118. ^ Feiling 1970, p. 441. ^ Feiling 1970, p. 442. ^ Feiling 1970, p. 443. ^ Self 2006, pp. 431–32. ^ a b c Self 2006, p. 432. ^ a b Self 2006, p. 433. ^ Smart 2010, p. 279. ^ a b Self 2006, p. 435. ^ Macklin 2006, p. 90. ^ a b Self 2006, p. 436. ^ Self 2006, pp. 435–36. ^ Self 2006, pp. 440–42. ^ Self 2006, pp. 439–41. ^ Dutton 2001, p. 74. ^ Dutton 2001, pp. 71–72. ^ Self 2006, pp. 442–43. ^ Self 2006, pp. 443–44. ^ a b Self 2006, p. 445. ^ a b Self 2006, p. 446. ^ Self 2006, pp. 447–48. ^ Self 2006, p. 447. ^ Self 2006, pp. 446–47. ^ Self 2006, p. 439. ^ Gazette, London. "The Right Honourable Arthur Neville Chamberlain" (PDF). Will probate instruction/information of Neville Chamberlain, Page 7145 – 16th December, 1941. London Gazette. Retrieved 13 March 2013. ^ Self 2006, p. 449. ^ Dutton 2001, p. 116. ^ Dutton 2001, pp. 76–80. ^ Dutton 2001, pp. 105–06. ^ Dutton 2001, pp. 108–09. ^ Dutton 2001, p. 106. ^ Dutton 2001, p. 107. ^ "XNC – Papers of Neville Chamberlain. 1. Family correspondence and other papers. NC1/2 (Transcribed Chamberlain family letters)". National Archives – University of Birmingham. Retrieved 15 February 2013. The letters were transcribed in 1915 by Norah Kenrick [wife of Neville Chamberlain's cousin and friend, W. Byng Kenrick] from the original letters then in the possession of Clara Martineau [daughter of Chamberlain's uncle, Sir Thomas Martineau]. ^ "NC13/17/197-237 XNC Papers of Neville Chamberlain". Birmingham University Archives. Retrieved 2 March 2013. ^ Walker-Smith, Derek. The Chamberlain City. Arthur Neville Chamberlain. Million Dollar Books: 21 November 2003. Retrieved 14 February 2013. ^ a b Dutton 2001, pp. 133–36. ^ Self 2006, p. vii. ^ Dutton 2001, pp. 143–44. ^ Dutton 2001, p. 181. ^ Dutton 2001, pp. 157–61. ^ Dutton 2001, pp. 162–64. ^ Dutton 2001, pp. 167–68. ^ Dutton 2001, p. 172. ^ Dutton 2001, pp. 182–84. ^ a b Macklin 2006, pp. 106–07. ^ Dutton 2001, p. 7. ^ "St. Helen's Bishopsgate: Monuments within the church - British History Online". www.british-history.ac.uk. ^ Craig 1977, p. 87. ^ Craig 1977, p. 83. Courcy, John de (1940). Searchlight on Europe. Eyre and Spottiswoode. Craig, F.W.S. (1977). British Parliamentary Election Results 1918–1949 (revised ed.). The Macmillan Press Ltd.
Daniell, Raymond (13 November 1940). "Commons tribute paid Chamberlain". The New York Times. Retrieved 6 November 2009. Dawson, Sandra (2006). "Working-Class Consumers and the Campaign for Holidays with Pay (TCBH Postgraduate Essay Prize Winner for 2006)". Twentieth Century British History. Oxford University. 18 (3): 277–305. doi:10.1093/tcbh/hwm005. Retrieved 12 September 2012. Dilks, David (1984). Neville Chamberlain, Volume 1: Pioneering and Reform, 1869–1929. Cambridge University Press. ISBN 978-0-521-89401-2. Dutton, David (2001). Neville Chamberlain. Hodder Arnold. ISBN 978-0-340-70627-5. Englefield, Dermot (1995). Facts About the British Prime Ministers. H. W. Wilson Co. ISBN 978-0-8242-0863-9. Faber, David (2008). Munich: The 1938 Appeasement Crisis. Simon & Schuster. ISBN 978-1-84739-006-6. Feiling, Keith (1970). The Life of Neville Chamberlain (Second ed.). Archon Books. Hadley, W. W. (December 1941). "Neville Chamberlain. 1869–1940". Obituary Notices of Fellows of the Royal Society. 3 (10): 731–34. doi:10.1098/rsbm.1941.0030. Halsall, Paul, ed. (August 1997). "Modern History Sourcebook: The Molotov-Ribbentrop Pact, 1939.". Internet Modern History Sourcebook. Fordham University. Retrieved 22 October 2009. Keyes, Ralph (2006). The Quote Verifier: Who Said What, Where, and When. Macmillan. ISBN 978-0-312-34004-9. Macklin, Graham (2006). Chamberlain. Haus Books. ISBN 978-1-904950-62-2. Meynell, Wilfrid (1903). Benjamin Disraeli: an unconventional biography. 1. Hutchinson & Co.
Self, Robert (2006). Neville Chamberlain: A Biography. Ashgate. ISBN 978-0-7546-5615-9. Smart, Nick (1999). The National Government. St Martin's Press. ISBN 978-0-312-22329-8. Smart, Nick (2010). Neville Chamberlain. Routledge. ISBN 978-0-415-45865-8. Taylor, A. j. p. (1965). English History, 1914–1945. Oxford University Press. "Purchasing Power of British Pounds 1264–2008". MeasuringWorth. Retrieved 11 December 2009. Aster, Sidney (1997). "Guilty Man: the Case of Neville Chamberlain". In Finney, Patrick (ed.). The Origins of the Second World War. Edward Arnold. pp. 62–77. ISBN 978-0-340-67640-0. Aster, Sidney (September 2002). "Viorel Virgil Tilea and the Origins of the Second World War: An Essay in Closure". Diplomacy and Statecraft. 13 (3): 153–74. doi:10.1080/714000341. Bond, Brian (1983). "The Continental Commitment in British Strategy in the 1930s". In Mommsen, Wolfgang; Kettenacker, Lothar (eds.). The Fascist Challenge and the Policy of Appeasement. George Allen & Unwin. pp. 197–207. ISBN 978-0-04-940068-9. Crozier, Andrew J. (1988). Appeasement and Germany's Last Bid for Colonies. Macmillan Press. ISBN 978-0-312-01546-6. Gilbert, Martin (1966). The Roots of Appeasement. New American Library. Goldstein, Erik (1999). "Neville Chamberlain, The British Official Mind and the Munich Crisis". In Mommsen, Wolfgang; Kettenacker, Lothar (eds.). The Munich Crisis 1938: Prelude to World War II. Frank Cass. pp. 276–92. ISBN 978-0-7146-8056-9. Greenwood, Sean (1999). "The Phantom Crisis: Danzig, 1939". In Martel, Gordon (ed.). The Origins of the Second World War Reconsidered: A.J.P. Taylor and the Historians. Routledge. pp. 225–46. ISBN 978-0-415-16325-5. Kennedy, Paul; Imlay, Talbot (1999). "Appeasement". In Martel, Gordon (ed.). The Origins of the Second World War Reconsidered: A.J.P. Taylor and the Historians. Routledge. pp. 116–34. ISBN 978-0-415-16325-5. McDonough, Frank (1998). Neville Chamberlain, Appeasement and the British Road to War. Manchester University Press. ISBN 978-0-7190-4832-6. McDonough, Frank (2001). Hitler, Chamberlain and Appeasement. Cambridge University Press. ISBN 978-0-521-00048-2. Petrie, Charles (1938). The Chamberlain Tradition (First American ed.). Frederick A. Stokes. Redihan, Erin. "Neville Chamberlain and Norway: The Trouble with 'A Man of Peace' in a Time of War." New England Journal of History (2013) 69#1/2 pp. 1–18. Stewart, Graham (2000). Burying Caesar: Churchill, Chamberlain, and the Battle for the Tory Party (revised ed.). Phoenix. ISBN 978-0-7538-1060-6. Strang, Bruce (1996). "Once More unto the Breach: Britain's Guarantee to Poland, March 1939". Journal of Contemporary History. 31 (4): 721–52. doi:10.1177/002200949603100406. Watt, D.C. (1989). How War Came: The Immediate Origins of the Second World War, 1938–1939. Heinemann. ISBN 978-0-394-57916-0. Weinberg, Gerhard (2010). Hitler's Foreign Policy, 1933–1939: The Road to World War II. Enigma Books. ISBN 978-1-929631-91-9. Wheeler-Bennett, John (1948). Munich: Prologue to Tragedy. Duell, Sloan and Pearce. "Archival material relating to Neville Chamberlain". UK National Archives.